Sometimes you just have to channel your inner Firestarter . 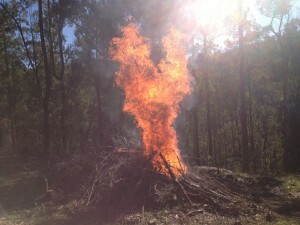 Fire season approaches and after a few years of rainy years the fuel load has built up everywhere. This year the ENSO cycle is swinging us towards a baking and rainless summer, and we’re therefore expecting a hot, dry, dangerous season of bush fires. 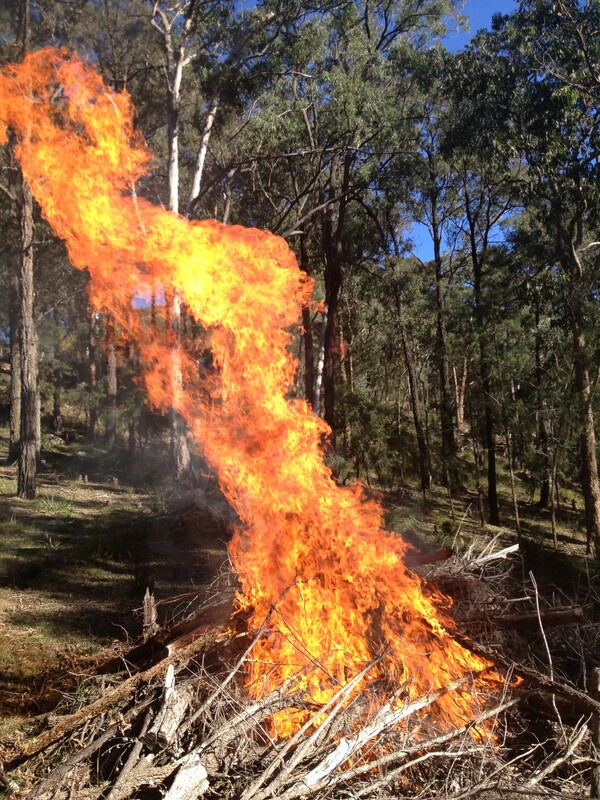 Time to clear some wind fall and maintain what the NSW RFS terms the Asset Protection Zone (APZ). 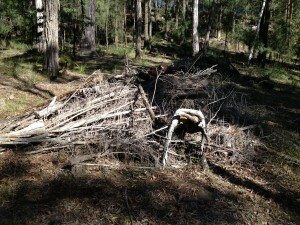 Last year there were a few burn piles I had built but then ran out of time to light up before we hit the summer fire-permit season. 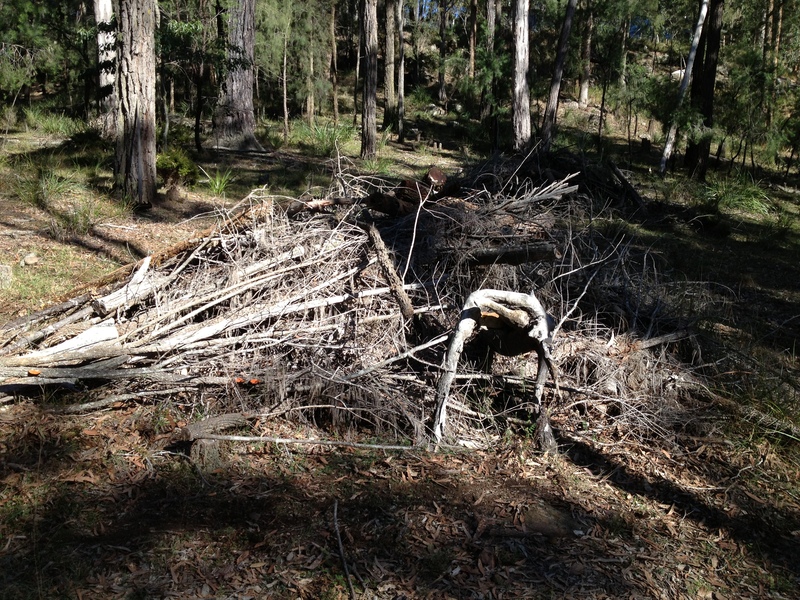 As well as getting through those I have also a few more new piles to build – all up we’re probably looking at about 7 burn piles before the summer officially starts. 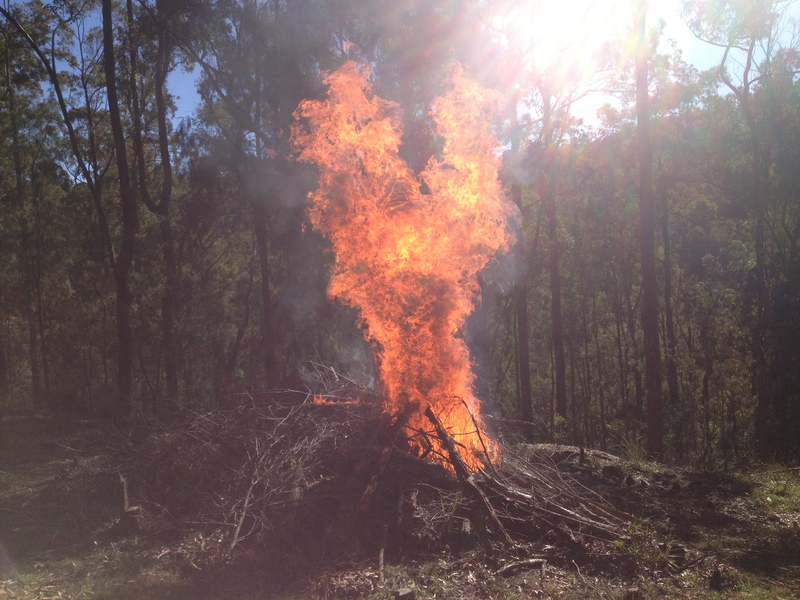 “Never start a fire you can’t put out” are wise words – so there is a bit of prep’ do before the matches come out. As the first pile is down the North East slope at the outer edge of the APZ this means setting up Davey as close to the pile as possible whilst still having a water feed handy, then running a hose down to the pile which is built about 50m from that pump location. Davey is being fed by the new header tank which has been filled as well, giving 10,000l of drenching ability should things go not-to-plan. Once the pump is ready the next step is to do a final clear around the pile with the fire rake, gear up in jeans, boots, wool jumper, leather hat, fire goggles, fire gloves and a protective wrap covering the face/neck/ears. That sounds very over he top until you’ve stood next to a burn pile at full fury – it’ll singe skin within seconds at distances less than 2 metres. The neighbours already having been warned to not panic at smoke columns it’s time to go. A little splash of diesel, flame introduced by way of gas powered, metre long fire wand….and…. “I’m a firestarter, terrific firestarter. 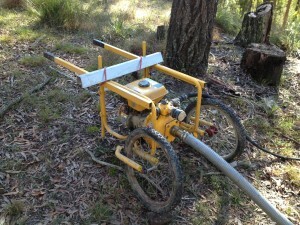 This entry was posted in ADVENTURES, Jobs done and things built, Practical stuff by Simonperry. Bookmark the permalink.